Wedding Planning is a very stressful time. In your rush to get things done you may become frustrated with unanswered emails and deadlines that have not been met. Perhaps your florist did not understand your vision. Perhaps your venue manager is not willing to be cooperative with your wedding planner or you are inundate with unsolicited but well-meaning advice. These situations are common and unavoidable. Maintaining your cool while pushing your manners to the limit is always a challenge except for those who concentrate on THE FIVE C's of wedding planning. 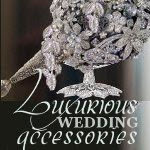 COOPERATION is the cornerstone of planning a luxurious wedding or any event. By being gracious you can enroll others to become a very productive support team. CONSIDERATION should be at the forefront off all your wedding decisions. Realize that everyone around you has your best interest in mind. Be considerate of their input. COMPASSION is a gift of love you can give to all who surround you. Hear each request as an effort to give to you, not take from you. 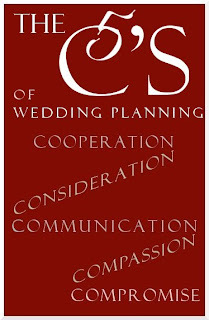 If you are compassionate you will be able to figure out how to alter the request or incorporate it into your wedding planning. COMPROMISE will be called for as soon as you begin the wedding planning process. Be considerate and guard the individual relationships you have with family members and friends. Balance each of their needs individually. Granting a small favor now could solidify a lifelong friendship. How willing are you to adapt to sticky situations and conflicts? Many agree that wedding planning can be the most confrontational time in your life. While planning your wedding, think ahead to the big picture. Marriage is between you, your spouse and your respective families. Your decisions, actions and behavior will be remembered by others for a lifetime. A positive attitude is contagious. A gracious bride knows that pitfalls loom but is psychologically prepared not to give any power or energy to conflicts. She is poised, happy, excited and grateful that so many have her best interest in mind.